The following article often refers to angles in the sky. The diagram above is a rough guide. Hand at arm’s length (courtesy of timeanddate.com). As the clocks go forwards on Sunday March 31st, we are now in British Summer Time (BST). All timings given in this article will therefore be in BST. For astronomers, it means of course that we have to wait one hour longer before it gets dark. What do we mean by ‘dark’? There are four ways we might define it! This is when – according to the Road Vehicles Lighting Regulations 1989 – road vehicles must put their headlights on (unless in a well lit 30mph area, in which case only sidelights are required). And the regulations state that this time is 30 minutes after sunset. This is when the sun drops to 6° below the horizon. 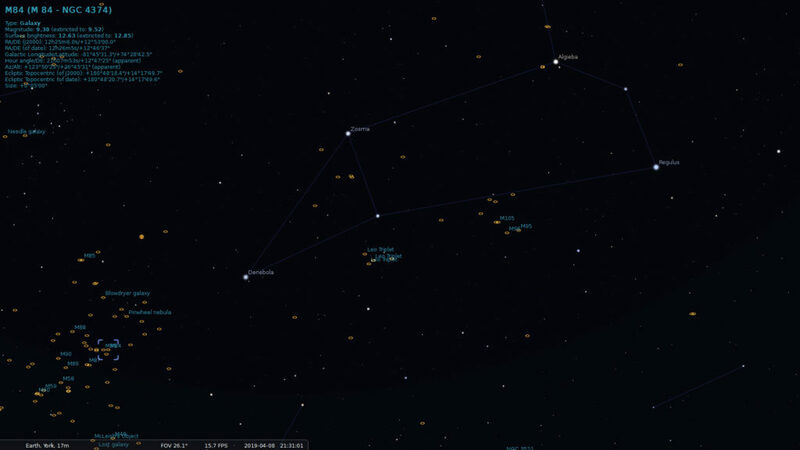 Bright stars and the five naked eye planets can be seen and clusters can be seen in binoculars, but no deep sky objects are visible, even with a telescope. This is when the sun drops to 12° below the horizon. Mariners consider that this is when it gets dark. This isn’t bad for astronomers. There’s a glow north of where the sun set but most deep sky objects are observable. This is when the sun drops to 18° below the horizon. Astronomers deem it only to be completely dark if the sun is this far down. The faintest deep sky objects can now be seen. The table below gives these timings and sunsets for York for four dates in April. Remember, all are BST. Notice how, at the beginning of the month, astronomical twilight is 2hrs 8mins after sunset, but by month end it is 2hrs 50mins after sunset. This is because, as the suns moves northwards on the celestial sphere, it sets at an ever decreasing angle to the horizon so takes longer to dip 18° below it. In fact, by 7th May, there is no astronomical twilight, complete darkness returning for a brief time centred on 0100 on 1st August. So what is all this telling us? It’s saying that April is the last month that the sky gets really dark, so if you want to see deep sky objects, get out there before it’s too late – or wait until August. Also, be aware of the Moon, which will produce background sky glow for much of the second half of the month. Best seen as a waxing crescent through first quarter to gibbous from Mon 8th to Tues 16th. Mercury, Venus, Jupiter, Saturn, Uranus and Neptune are all either impossible to see because they are too near the Sun, or very poorly placed for observing this month. Diminutive Mars (now at mag. 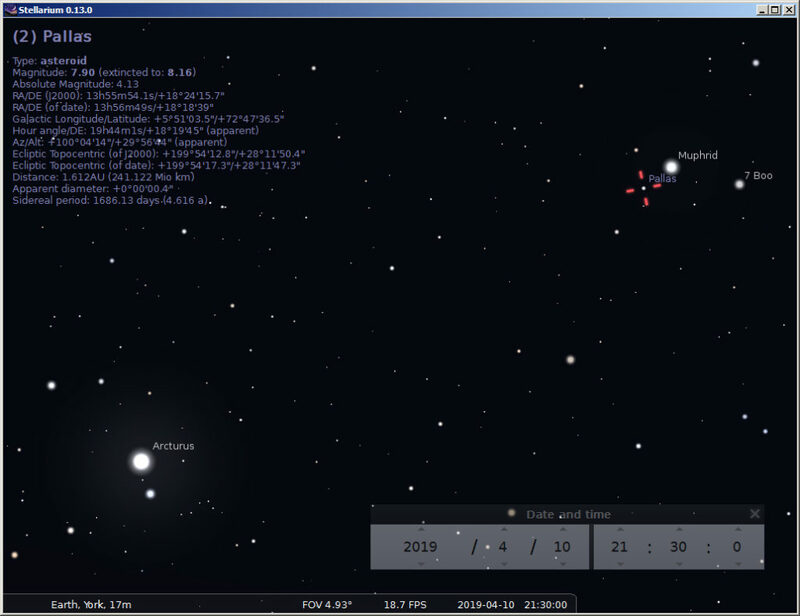 1.5 and only 4 arc secs in diameter) can be seen due west and 9° above the Moon on the 8th. Only with powerful telescopes and under perfect seeing is there any chance to see any surface markings. We can wave goodbye to Mars now, until its return to the morning sky in August 2020. It reaches a fairly favourable opposition on 13th October 2020. The asteroid Pallas reaches opposition on the 4th April, and on the 10th it passes very close to the star Muphrid (Eta Boötes) giving us a rare opportunity to spot it easily. Pallas is at magnitude 7.9 and Muphrid is at magnitude 2.7. It’s easy to hop from Arcturus (Alpha Boötes at magnitude 0.15) to Muphrid (about 5° to the WNW of Arcturus) where you will see Pallas just ¼° away from Muphrid in the direction of Arcturus. In fact, due to its large inclination (35°) to the plane of the ecliptic, Pallas is travelling northwards and if you look on the 9th, 10th and 11th, you will see it changing its position. The first sky diagram below shows where Boötes and its brightest star Arcturus are at 2130; the second is a finder chart approximately 5° wide. 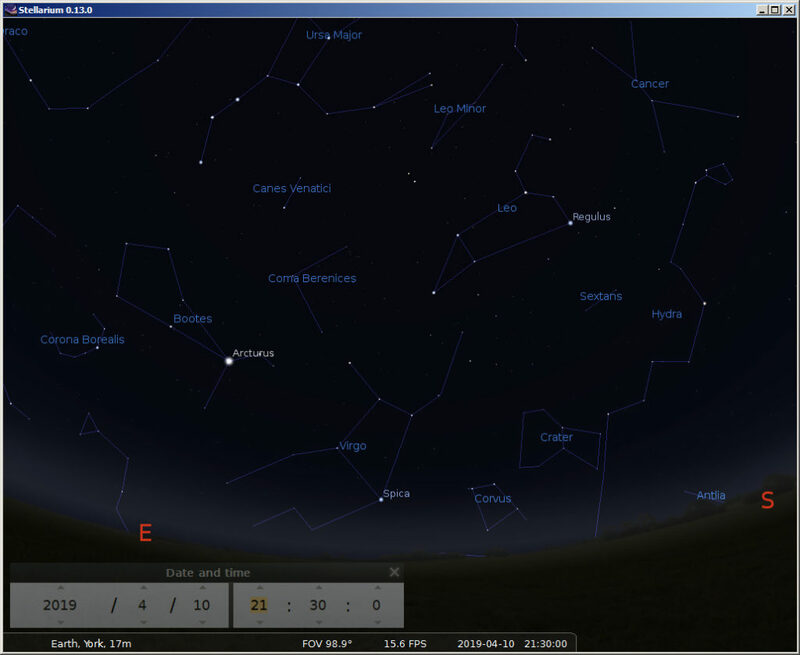 A small telescope or even binoculars will show all the stars in this chart. Stellarium screenshot showing the position of Pallas. Last chance before the light nights, and best seen before the first quarter Moon on the 12th or after the 20th. If you can wait until after nautical twilight, then do so. And for the first 10 days in April, astronomical twilight at about 10pm is still within social hours. 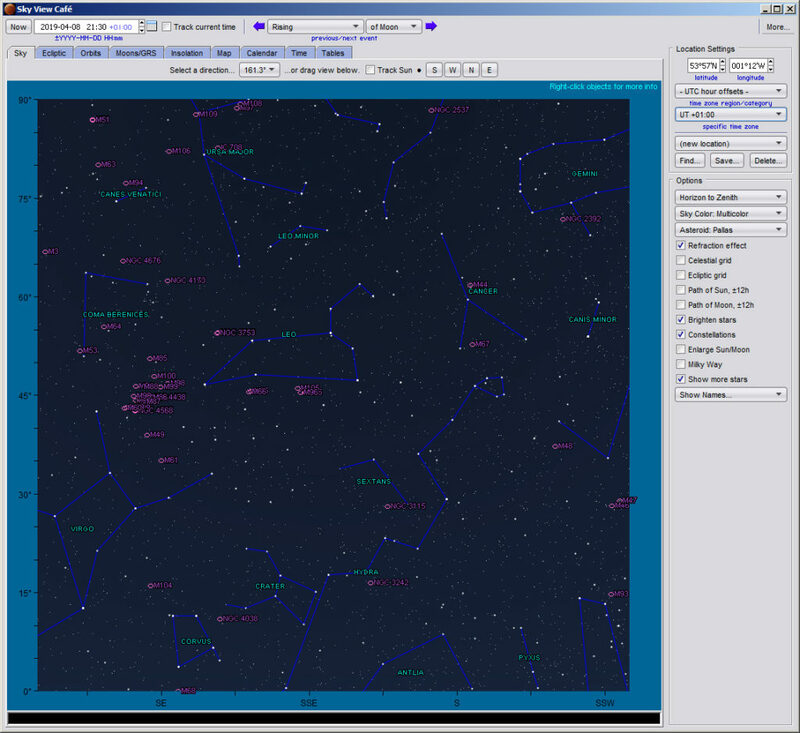 There follows a shortlist of objects – all shown on the general wide-field sky chart below – that are roughly in the south at 2130 hrs between the 1st and the 10th or after 11pm from the 20th. An open cluster in Cancer of about 1000 stars with a combined magnitude of 3.7. Easily visible to the naked eye on a clear, dark night. Best seen with binoculars or any eyepiece-telescope combination that delivers a field diameter of 1½°. That’s three times the apparent diameter of the Moon. The detailed sky chart below shows the location of these famous clusters of galaxies. April is the best time to see these before midnight, and your last chance until February next year. See this Sky and Telescope article for an excellent description and photos of these and other nearby galaxies. A famous trio of galaxies of about 9th or 10th magnitude all visible in the same low power field. It’s possible to see them with a 3″ refractor but larger apertures will make spotting them much easier. These two galaxies are the brightest close pair within the massive Virgo cluster. It’s worth just slowly panning across this area of sky with a wide field eyepiece to see how many galaxies you can spot. Well, he did it! Elon Musk, the triple-nationality (South Africa, Canada, United States) entrepreneur CEO of SpaceX and possessed of a personal fortune of 23 billion dollars, has succeeded in launching his unmanned Crew Dragon spacecraft to dock with the ISS and return it safely to earth. After this “Demo-1” demonstration mission, SpaceX plans to conduct an in-flight test of Crew Dragon’s emergency-escape system; if all goes well with that un-crewed launch, Crew Dragon could carry two NASA astronauts to the ISS on the Demo-2 demonstration flight as early as July. More information in this latest from spacenews.com.